It’s hard work getting all of your orders packed up safely and sent out, but someone has to do it! That’s where Cami comes in. Coming up on her one year anniversary with Ambre Blends in October, Cami works in order fulfillment and shipping at Ambre Blends. Learn more about Cami in this month’s staff spotlight! What is a day in the life of Cami like? It starts with coffee. From there, I get my three girls ready for their day at school and head into Ambre Blends to fill/ship. Then I pick up the kids at 4pm, hit the pool or sports field, have dinner, do homework, gives baths and then enjoy some bad TV while folding laundry. Jealous? What’s your favorite part about working for Ambre Blends? Hands down, the people. There’s lots of “she-power” in the Ambre Blends Disco Hut! What are some of your favorite organic products to use? I really love Kroger’s Simple Truth products, they keep it simple and affordable. Some other products I love are Dr. Bronner’s peppermint soap, Toms toothpaste, lots of Annie’s Naturals…I’m obsessed with Navitas Naturals Cacao nibs. What is your favorite Ambre Blends product/essence? It’s hard to pick only one favorite. The Solace Oil Essence is a must. My favorite products are the soaps and deodorant; once you are accustomed to wearing a natural deodorant, you can never go back to an antiperspirant. You are designed to sweat and with Ambre Blends deodorant, at least you’ll smell fabulous. What’s a fun fact about you that people don’t know? I made it backstage at Grateful Dead, the Deer Creek Summer Tour ’94. I actually said “hello” to Jerry. What do you enjoy doing outside of work? Hanging with my husband, Jim, and three girls, Bella (12), Iris (9) and Maeve (6). Weekends with nothing planned are the best. Why should people be using Ambre Blends? What’s the number one thing you wish people knew about Ambre Blends? We have a lot of love for the product and it shows. All Ambre Blends products are carefully and lovingly handcrafted, locally by (mostly) women! 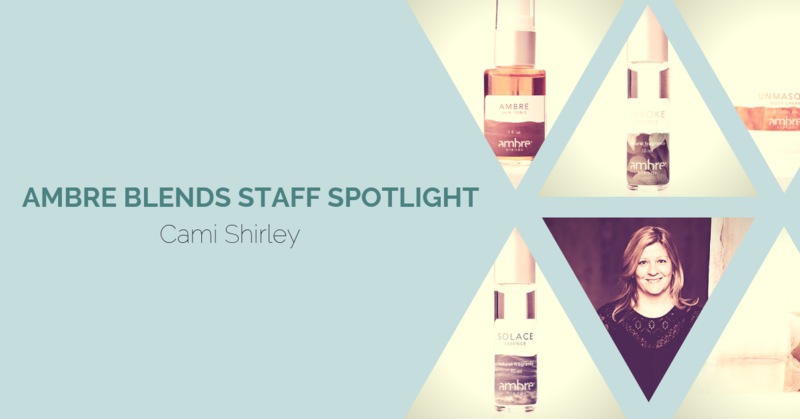 What has been one of the most rewarding experiences about working at Ambre Blends? I get to work with an intuitive and inspiring group of female entrepreneurs who value work/life balance. I’ve just reentered the workforce and this support essential for me. What was your first job? A “casual mail carrier” with the USPS. Anything else we should know? In a world where you can be anything, be kind.